It means different things to different people, and we can respond to virtually any need. In most cases, it's about planning a unique itinerary, selecting activities, hotels and restaurants. This is sometimes more practical than doing it all yourself because when we plan it there are no snags or surprises. Travel agents call it FIT – fully independent travel – but let's avoid arcane jargon. The fact that you're reading this page says a great deal about you, and it's something most independent travelers have in common: You're not just an "independent traveler," you're an independent thinker not readily given to "following the crowd" wherever it goes. And you're willing to spend a little more time, effort and expense to get there. There's no single "ideal" approach to planning your holiday, so different agencies employ different strategies. Ours begins with knowing which things you want to see and do, bearing in mind the time available. It's a step-by-step procedure. A theme holiday might focus on archaeology, food and wine, or another element, but our experience has taught us that most visitors prefer an itinerary that includes several interesting elements – medieval history, ancient archaeology, art, culture, and of course great food. Sicily offers plenty of all these things. One of the most convenient things about independent travel planning is that it allows for special solutions in particular circumstances. In one place you might prefer to have a tour guide, while preferring a completely independent experience elsewhere. Palermo, for example, is a chaotic city where having a guide can be useful, but serene archaeological sites like Segesta and Agrigento are fun to explore on your own. With Sicily Concierge, you have access to a personal travel assistant during working hours, and (for emergencies) 24 hours a day, so while you're traveling independently you'll never be completely alone. 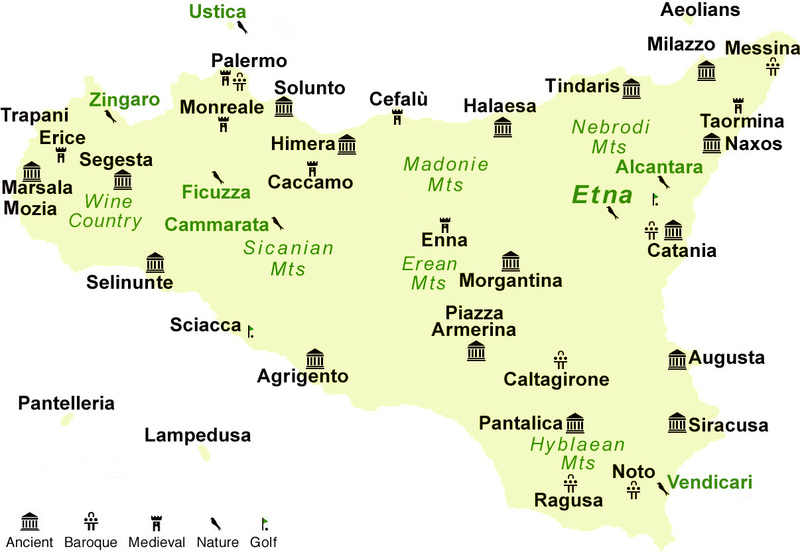 This map shows you where to find some of Sicily's more interesting attractions.